Last November I covered how Europe’s VR meetup community has more than doubled in its member base of freelancers, startups and companies. 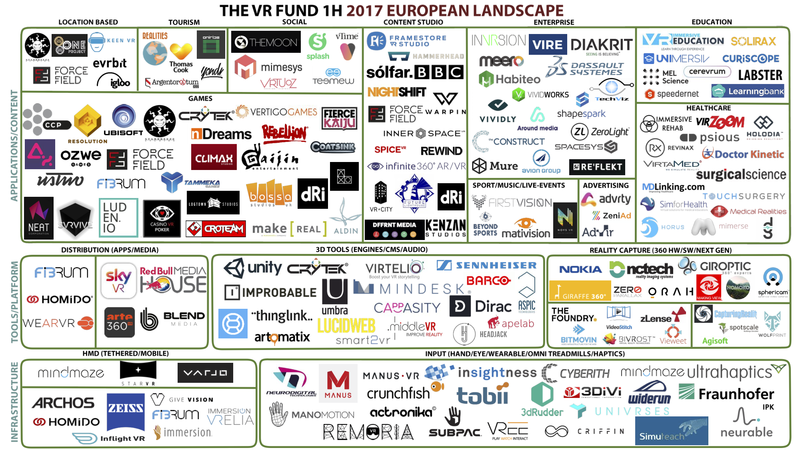 The booming region has given rise to the likes of EUVR, a nonprofit organization dedicated to maturing the VR industry in Europe by offering platforms and resources to help address issues like its increasingly fragmented ecosystem. Its first platform to debut in April was an interactive database that offers the kind of visibility that is often sorely lacking in an emerging tech space. A leading Japanese mobile game studio, Gumi, is supporting the EUVR with investment and resources that translates into a healthy vote of confidence on the value-add that the database offers the region’s rapidly growing VR community. “Europe has the potential to become a leading region in VR content: Our creativity, our cultural heritage and our talents are all assets that can be used to create unforgettable VR experiences, amazing video games and disruptive B2B applications. We feel this database can help support the growth of this industry in Europe,” Juan Bossicard, co-founder of EUVR, told me. Last February, Silicon Valley-based venture firm, The Venture Reality Fund, released its first European VR landscape in partnership with LucidWeb, a Belgian VR and WebVR consulting and development agency. It was the result of extensive research and information gathered in correspondence with regional VR ambassadors across Europe, and at the time it tracked about 300 active companies in the region. Now, six months later, that figure has jumped to 487 companies, of which 188 are featured in the landscape (up from 116). More than half of these movers and shakers are based in the United Kingdom (46), France (29), Sweden (19) and Germany (15). The selection criteria to appear on the list required that a company received formal funding and has a commercial product on the market. Unsurprisingly, gaming continues to be the most competitive and crowded space. Two studios particularly of note are Sweden-based Logtown Studios, which raised €600,000 back in February for its first VR game title, and U.K.-based nDreams, which raised USD $3.47 million just last month. The fast-growing user input sector, which focuses on interactions in VR by brain (BCI), body, eyes, feet and hands, also continues to garner the attention of investors. Of the 22 companies reviewed, eight were added to the landscape. U.K.-based Ultrahaptics’ $23 million Series B round definitely raised a lot of eyebrows. But if investment size is what floats your boat, then the 3D tools space is where you should look. U.K.-based Improbable raised a groundbreaking $500 million from SoftBank in its Series B round last May, creating exactly the kind of regional buzz to keep the players in the space hopeful during the trough of disillusionment through which the industry is currently wading. With this second release, LucidWeb launched a public Trello for a complete list of Europe’s fastest growing VR companies. They, along with The VR Fund, will update the landscape semi-annually.